"Guaranteed to stay moist as long as you don't leave them out." In a medium bowl, cream together shortening and sugar until light and fluffy. Beat in eggs one at a time. Stir in vanilla extract, baking powder, salt, and instant banana pudding mix. Mix in 2 cups flour. Gradually mix in remaining 1/2 cup flour as needed to form a workable dough. Cover, and chill in the refrigerator at least 2 hours. Preheat oven to 375 degrees F (190 degrees C). Grease baking sheets. Shape dough into walnut sized balls, and place 2 inches apart on the prepared baking sheets. Flatten balls to a thickness of about 1/4 inch. With cookie icing it reminded me of cake with banana filling. Family enjoyed them and hubby even asked for them again. 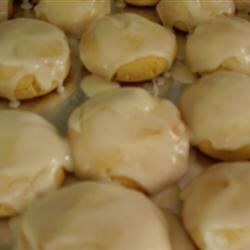 Loved them with vanilla pudding and 2 mashed bananas. Nice soft cookie with lots of banana flavor. I rolled them into a log and sliced to bake. I might try a little drizzle or frosting on them next time. I used cheesecake flavored pudding because I didn't know what else to do with it. They turned out pretty good. I made this with french vanilla pudding because I don't like fake bananna. Tasted o.k. could use more flavor... texture was very good.